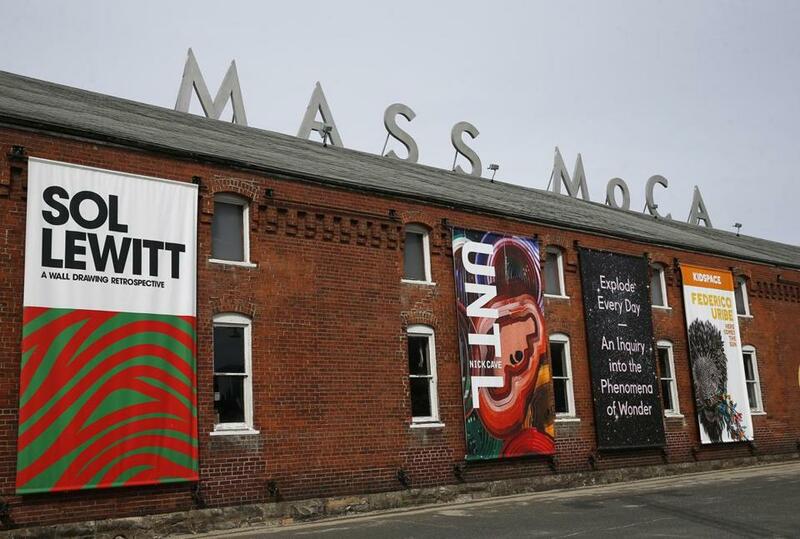 The Massachusetts Museum of Contemporary Art’s 130,000-square-foot expansion will make it the largest contemporary art museum in the country. NORTH ADAMS — When the Massachusetts Museum of Contemporary Art opens its newly renovated Building 6 on May 28, the expansion will give this 16-acre campus in the Berkshires more gallery space than any other contemporary art museum in the country. It will also be a place whose scale becomes infinite once you don a virtual reality headset, and where you may come to know, as never before, the unsettling power of a roomful of blue. Mass MoCA has always been about the vast and the outlandish, an unlikely arts mecca in a tired mill town that has also become an unlikely but very real success. Building 6 expands dramatically on that fact. An all-day celebration will herald the grand opening for the new building, which will showcase installations by art-world stars such as Jenny Holzer, Laurie Anderson, Robert Rauschenberg, Louise Bourgeois, and James Turrell. The colossal structure — its three floors can be measured in acres — adds 105,000 square feet of gallery space to the museum, bringing its overall exhibition area to more than 250,000 square feet — outpacing Boston’s Museum of Fine Arts. Known formally as the Robert W. Wilson Building, after a longtime supporter, the project will usher in a new era of performing arts at the museum, while realizing an ambitious long-term strategy to partner with artists. The art museum is putting the finishing touches on its massive Building 6, set to open in May. But for Joseph C. Thompson, the museum’s folksy director who’s nursed Mass MoCA into existence over the past 30 years, the Wilson building marks something else as well: the museum’s most convincing bid yet to turn its out-of-the-way campus of old factories into an international magnet for contemporary visual and performing arts. “It requires a pilgrimage mentality,” Thompson said recently of the museum’s visitors, as crews put finishing touches on the new building. 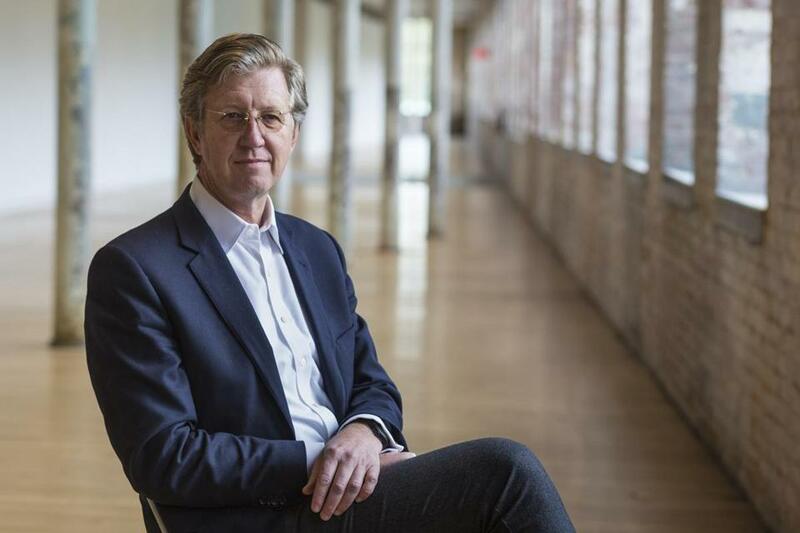 In other words, the project, funded by $25.4 million from the state and $40 million in private donations, is a giant step forward for Mass MoCA, a museum with a $10.6 million annual budget and virtually no permanent collection. Among the building’s most impressive holdings are nine installations by Turrell, the acclaimed space and light artist whose ethereal environments envelop viewers in fields of radiant color. The Wilson building devotes numerous galleries to the artist, essentially a mini-retrospective. 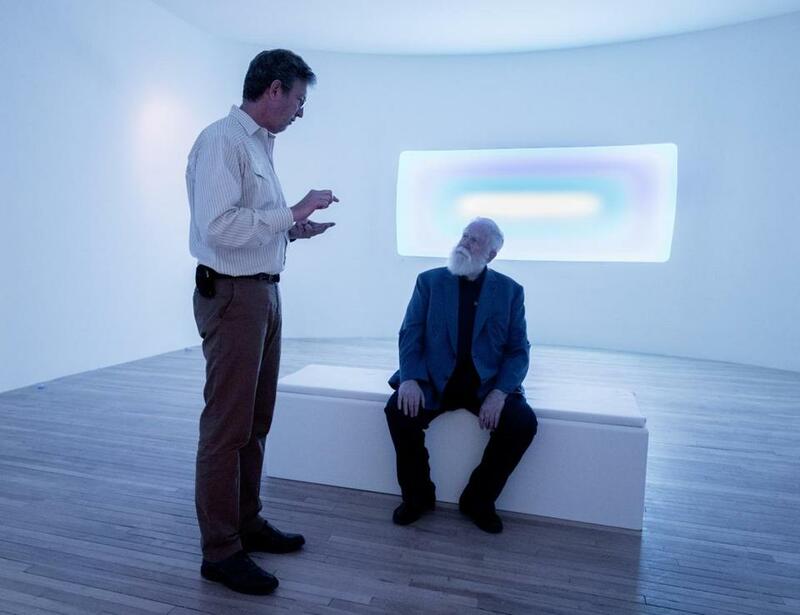 James Turrell (right) with Mass MoCA director Joseph C. Thompson at the museum. During a recent visit, Turrell spent nearly an hour “tuning the light” in “Perfectly Clear,” an almost cornerless room that during a 60-minute cycle is suffused with a rainbow of color. The work is part of Turrell’s “Ganzfeld” series: luminous environments that can cause a loss of depth perception. In some color spectrums, the room itself seems to disappear, creating an eerie, disembodied feeling — intimate yet infinite — in which the viewer is surrounded by nothing but light. Eight of the installations are on long-term loan. The Ganzfeld piece is a gift — a rarity for the non-collecting museum. Anderson, a multidisciplinary performance artist, is similarly concerned with perception. With plans to create and present work here over the next 15 years, she is opening with a pair of exhibits that feature virtual reality. “It’s about disembodiment,” said Anderson, who has turned one of her galleries into a black-light phantasmagoria of painted figures and words — the beginning of stories that viewers can explore virtually once they don their VR headsets. The museum has entered a similar 15-year agreement with Holzer. Known for her subversive work with language, Holzer has created a series of inscribed stone benches placed throughout the museum campus and is creating a large-scale projection for the side of Building 6 this summer. Holzer’s inaugural gallery exhibition features LED works and paintings that explore the dark nexus of enhanced interrogation and the war on terror. Using declassified government documents she obtained through the Freedom of Information Act, Holzer has silkscreened the redacted files onto the painted canvases. A work by watercolor artist Barbara Ernst Prey depicted the Building 6 interior during renovation. With so much space to fill, architect Jason Forney, whose Cambridge-based firm, Bruner/Cott & Associates, designed the industrial building’s renovations, described the various galleries as “museums within a museum.” Two of those “museums” boast works by major 20th-century artists: Bourgeois and Rauschenberg. Over the next 10 years, Mass MoCA will house four works by Bourgeois, including a pair of monumental sculptures that had to be hoisted in by crane. One of them, a 15-ton marble sculpture, has never before been exhibited in the United States. Its sensuous arrangement of hollows, orbs, and spirals sits across the gallery from the sexually charged “Pass,” a blocky work featuring a range of ambiguous body parts. The museum has also arranged to exhibit Rauschenberg’s “A Quake in Paradise (Labyrinth),” a large 1994 work made of groups of silkscreened panels — some clear, others reflective — arranged in a maze-like configuration. Thompson said he hopes that the Rauschenberg exhibitions will change every few years. Then there’s a gallery featuring the peculiar creations of former Bennington College music professor Gunnar Schonbeck, a little-known but revered figure who during his lifetime hand-built more than 1,000 instruments. Schonbeck would often distribute his creations — outsized congas, triangular cellos, coconut ukuleles — for people to play during public jam sessions, an experience Mass MoCA plans to re-create. So was the massive outlay of energy and funds for the expansion worth it? Will the new building bring more visitors? Museum representatives say they expect it will grow attendance by 20 to 30 percent. That would continue an upward trend: Last year, the museum hosted 165,000 guests, an increase of 45,000 from 2012. “Mass MoCA Mecca,” quipped artist Dawn DeDeaux, who’d driven up from New Orleans to install her work in the new building. Joseph C. Thompson, director of Mass MoCA. As in years past, the museum plans to host musical events throughout the year, including the Solid Sound Festival, the Bang on a Can Summer Music Festival, and the FreshGrass Festival, as well as individual concerts featuring Joan Osborne, Booker T. Jones, My Morning Jacket, and Cake, which will play at the opening. 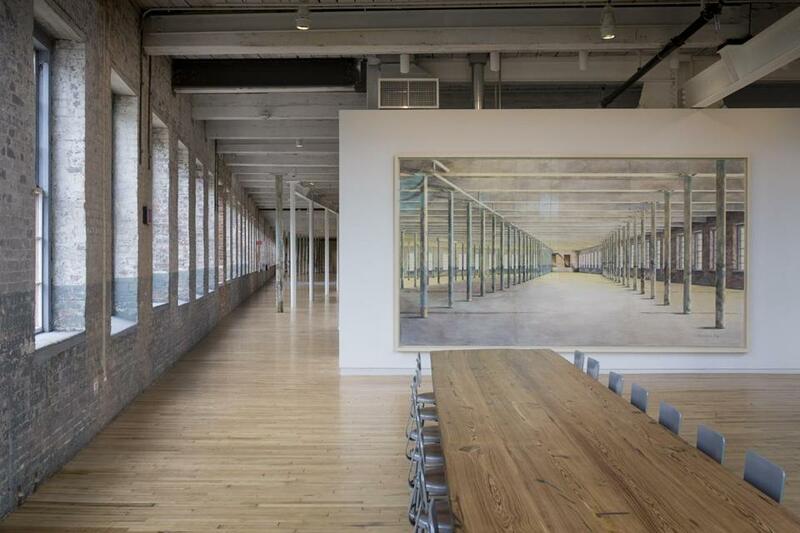 Thompson said that with its new catering facilities, green rooms, and rest rooms, the Wilson building will enable Mass MoCA to expand that programming, while also offering visiting artists better amenities. Malcolm Gay can be reached at malcolm.gay@globe.com. Follow him on Twitter @malcolmgay.